New Design Studio in Historic Newspaper Publishing Building in Old City. 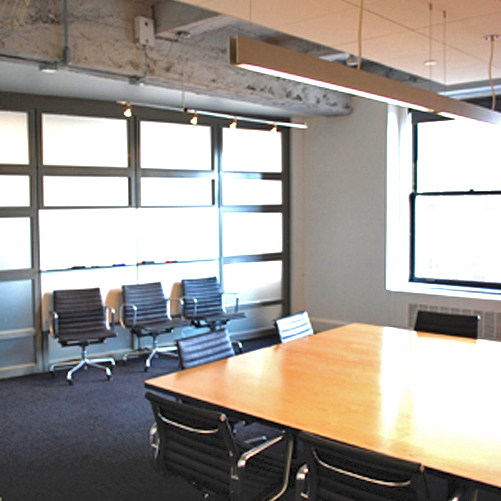 In 2007, DLR Group expanded its operations into the Philadelphia market through a strategic merger with Becker Winston Architects. After investigating a series of spaces, the principals of the firm decided to bring two regional offices together in one design studio located in the historic Public Ledger Building in Old City Philadelphia. DLR Group's Philadelphia Design Studio was seen as a way to knit together two studio cultures under a new unified leadership structure. The Philadelphia Design Studio takes advantage of the layers of history within the existing space by preserving the raw loft-like interiors with careful insertions of new program, structure, and skin. Clear distinctions are maintained between the delicate new construction that uses light as its muse and the historic heavy masonry structure and skin. Principal Brian Szymanik served as Project Manager with DLR Group.